HTC One M8 was launched more than one month ago across all the major US carriers. AT&T is no different. But today the have managed to offer a new color variant to their customers - Glacial Silver. Previous two color options - Gunmetal Grey or Amber Gold color are available too. AT&T is offering the new color variant same $199.99 price tag with a new two-year contract. If you are using the carrier's Next 12 plan, then you can purchase the smartphone for a monthly fee of $32 for 20 months. For those AT&T consumers on the Next 18 plan, the device will cost $24.62 for the next 26 months. You can also buy the unlocked retail unit of HTC One M8, which will cost you $640 at once. 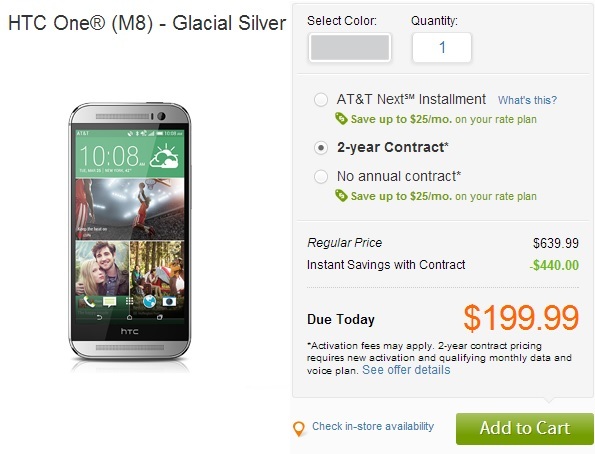 So see all the available offer for HTC One M8 on AT&T network hit this link now.